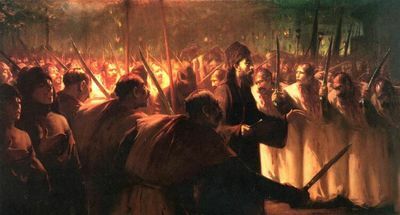 The Tenth of Muharram, by Ottoman court painter Fausto Zonaro (1854-1929). The Center for Islamic Pluralism extends warm greetings to Muslim and Jewish believers on the intersection of Ashura, the Islamic commemoration of the death of Imam Husayn, may Allah be well-pleased with him – the grandson of Prophet Muhammad, peace be upon him – and the Jewish observance of Yom Kippur, the Day of Atonement. Ashura and Yom Kippur will both fall on the 11th of October 2016, according to the Common Era (Christian and secular Jewish) calendar. Ashura begins on the evening of the 10th of Muharram, Islamic hijri year 1438, which corresponds to the evening of the 10th of October 2016. Yom Kippur will commence on the next evening, the 9th of Tishrei, Hebrew year 5777, or the 11th of October 2016. Both continue through the following days. Yom Kippur includes a sundown-to-sundown one-day fast. Qur'an 2:183 commands, 'O Believers! Fasting is prescribed for you as it was for those who preceded you.' Islamic tradition recounts that Prophet Muhammad observed with approval the Jews who fasted while living in Madinah. The two holy days, like their calendars, do not parallel one another. The Common Era calendar is a solar calendar and the Hebrew calendar and Islamic hijri calendars are lunar. But the Hebrew calendar is adjusted to conform to the rhythm of the seasons, and coincides generally with the Common Era calendar. The Islamic hijri calendar lacks additional days that were added to the Christian Gregorian calendar and the Jewish calendar. Therefore, Islamic dates, including the holidays of Eid Al-Fitr (Ramazan Bajram) and Eid Al-Adha (Kurban Bajram), are counted earlier with the coming of each year. Bektashi Principles. 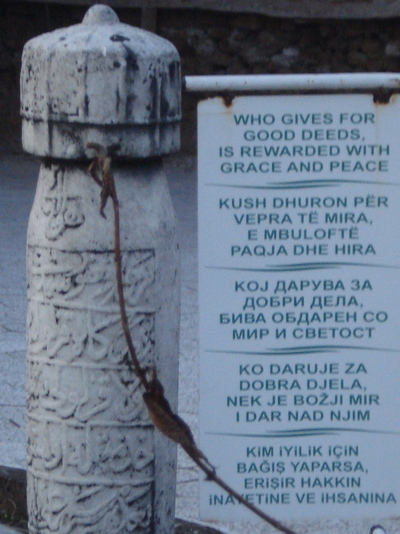 Monument at the Harabati Baba Bektashi Teqe in Tetova, Republic of Macedonia. Photograph 2010 by the Bektashi Community of the R.M. But Ashura, especially now, has a deep significance. The first ten days of Muharrem are known to the Bektashi Sufis of the Albanian lands as 'Matem,' and include fasting. The intention of the Bektashis is to mourn the death of Imam Husayn in the battle of Karbala, in Iraq in 680 C.E. In this regard the Bektashi view of Ashura is the same as that of Shia Muslims in general, for whom Ashura is a major observance, as well as for some Sunnis and other Sufis. Ashura calls on believers to search their consciences to find ways to strengthen Islam in the long aftermath of the tragedy of Imam Husayn. For our Shia friends, brothers, and sisters, it currently offers a challenge: to ponder the horror that has befallen Syria and to question the alliance of Shias from Lebanon to Pakistan, and throughout their diaspora, with the regime of Bashar Al-Assad. The Syrian ruler has gained the support of Russia, in a campaign that has left hundreds of thousands dead and millions without shelter. Iran has approved of this action. Kurdish fighters against ISIS and against other jihadis are not Wahhabis. The Kurds have a rich religious culture that promotes pluralism in a way absent from the history of the Al-Assad regime. Kurdish ranks include numerous Shia Sufis. The Kurdish model of secular rule, construction of democratic institutions, and similar indications of positive intent should be preferred over both the Iranian theocratic system and the military-police dynasty of Al-Assad. Shia Muslims should turn away from Al-Assad while there is still time to do so, and thus escape the stain of help to the Russians in their atrocities. As Shias well know, Ashura is a time for reaffirmation of the principles of Imam Husayn, which should not be denied by association with the cruel tyranny in Damascus.